This beautifully decorated home is large enough for wedding groups and family get-togethers. It is situated on two lots directly on the lake. The home has a open concept floorpan and sleeps between 8-13 (8 adults max). There is a large dining table indoors and for family meals or parties. The home has just about floor-to-ceiling windows along the whole back of the house both upstairs and downstairs to never miss a view of the lake! Upstairs there is a game room with a 70inch TV and an 8 ft pool table. There is also an beverage refrigerator and a 3.5cf freezer upstairs for extra storage. Along the back of the house, is a huge deck with ample space for entertaining that includes sectional seating, rocking chairs, a dining table, grill and pergola with bar and fire pit. The jetski will be available from April 1-Thanksgiving weekend each year (dependent on lake conditions). Lots of memories to be made with family and friends!! 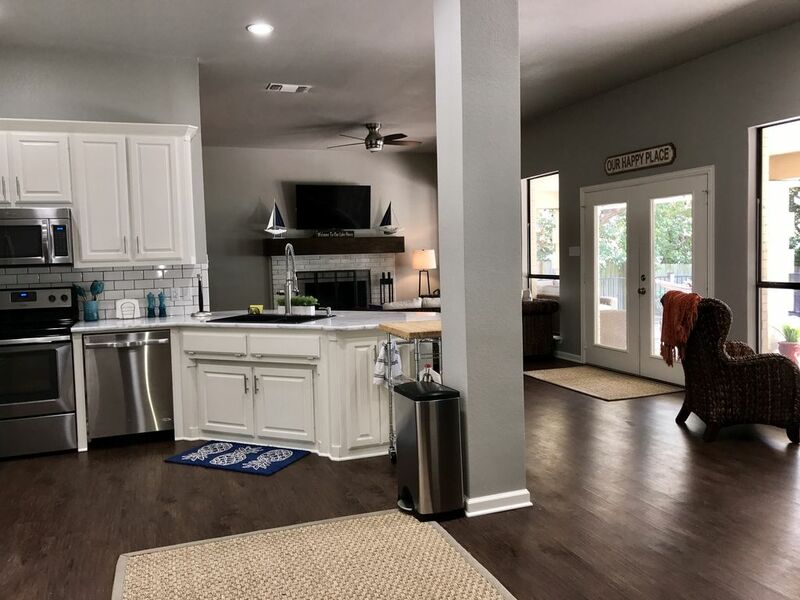 Beautifully decorated home with outstanding views of Lake Weatherford and plenty of room for guests! The pool table upstairs provided hours of entertainment and coffee on the back deck started the days off just right. Bill was a wonderful host and had everything arranged perfectly. Our family is already talking of a return trip this summer. The house was perfectly located for all the events of the week- granddaughter’s 1 year old birthday, Christmas, Rehearsal dinner, Anniversary, and most importantly, my son’s wedding. The church was in Weatherford and the reception was in Aledo. What a week. It was nice to come home to the comfortable peaceful home on the lake which was lovingly decorated for Christmas by Bill and Janine. My granddaughter loved the lights and ornaments on the tree. It was the perfect place for celebrating, cooking, entertaining, relaxing, and playing. Thank you Bill and Janine. Our son and his groomsmen stayed in this house during the wedding weekend. It was perfectly located for the wedding at The Brooks at Weatherford. The house was immaculate. The lake side location is beautiful. The hosts are extremely accommodating. It could not have been better! The lake house met and exceeded our expectations. We spent Thanksgiving there with our 6 adult children and 3 grandchildren. There was plenty of beds for all of us. The game room upstairs with large windows overlooking the lake was a perfect spot for the guys to hang out. The kitchen had most everything we needed to serve our Thanksgiving dinner. The spot light for us was the covered porch with extra large fenced in deck where our toddler grandkids ran and played most the days! Thank you Janine and Bill for making our family Thanksgiving a success! This house was more than perfect and the owners were very accommodating! This house was more than I could have asked for for my bridal party! My closest friends and I had the best time at this home. The kitchen was great and the back porch was even better! This house is perfect for any season! Can’t wait to stay here again!